LockDown Zero System stop-locking turrets allow the user not only to find the zero point of the scope, but to lock it in place. Rapid, precise return to zero. MOTAC - Motion-sensing technology immediately powers up illumination when motion is detected, and powers it down when it does not - saving battery life and ensuring power is there when needed. 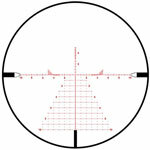 Stealth ID - the industrial design of Sig Electro-Optics is based on their legendary firearms; deflection armor trapezoidal surfacing breaks up shape and pattern of the optic. LensArmor - Getting the most durability out of the scope via this abrasion-resistant lens coating, to ensure your optic stays crisp, clear, and bright. Sig Optics Infinite Guarantee - They're guaranteed forever - an unlimited lifetime guarantee. Fully transferable, no warranty card or receipt required. Period.